Two of the six people sickened at Montessori of Alameda preschool in Portland, Oregon have infections from E. coli O157:H7 that match the outbreak strain that has sickened at least 16 people in the national I.M. Healthy SoyNut outbreak. Four of the six are ill with E. coli O157:H7. Two other people have shiga-toxin producing Escherichia coli (STEC) infections, which can cause serious illness and kidney failure. Shiga toxins are made by this bacteria. They bind to the intestinal wall and invade the bloodstream, killing red blood cells. Further test results are pending. The health department has been investigating a diarrheal illness at the school since March 7, 2017. Dr. Jennifer Vines, Multnomah County Deputy Health Officer said in a statement “We are working closely with families, staff, and school administrators to stop the spread of this infection and understand how this outbreak happened.” She added that if people have any of the recalled products in their homes, they should throw it out or return it to the store where it was purchased. Wash your hands well with soap and water after handling these products. I.M. Healthy SoyNut Butter products were recalled on March 4, 2017 after the CDC announced a multistate E. coli O157:H7 outbreak was linked to those products. That recall was expanded on March 7, 2017 to include the all of the company’s SoyNut Butter and granola products. The Multnomah County Health Department is investigating how the E. coli strain was introduced into the school. The product is a peanut butter substitute and was sold to schools, childcare centers, and other institutions around the country. The Health Department is asking that any child who is sick with vomiting or diarrhea should not attend school. 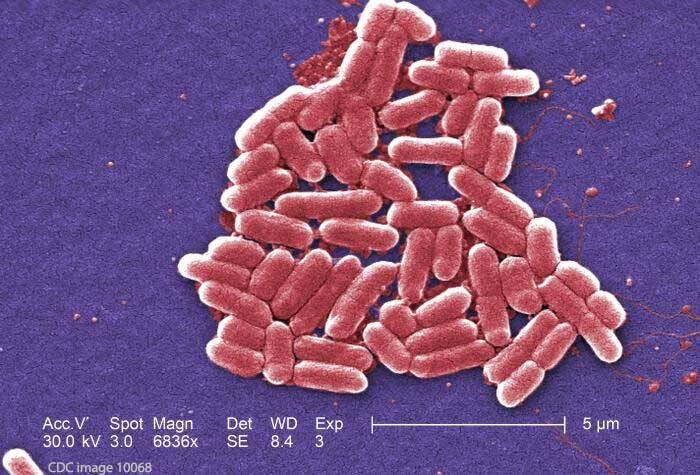 E. coli O157:H7 bacteria can be transferred person to person. If your child is sick with an illness like this, contact your doctor, since these infections can be very serious. If an E. coli O157:H7 infection is improperly treated, or if the patient is under the age of five, a complication called hemolytic uremic syndrome (HUS) can develop. This condition can cause kidney failure and lead to strokes, seizures, and death. The multistate outbreak has sickened at least 16 people in nine states. Eight of those people were hospitalized, and five of them did develop HUS. The Oregon Health Authority found the outbreak strain of bacteria in an open container of I.M. Healthy SoyNut Butter taken from a patient’s home. The symptoms of an E. coli O157:H7 infection include severe abdominal and stomach cramps and pain, diarrhea that may be watery and/or bloody, and a mild fever. These symptoms can appear up to 10 days after exposure to the pathogenic bacteria, but usually occur 3 to 4 days later. The symptoms of HUS include little or no urine output, pale skin, easy bruising, a skin rash, lethargy, and bleeding from the nose or mouth. About 5 to 10% of E. coli O157:H7 cases develop this condition, but in this outbreak, more than 30% of patients have HUS. If anyone is experiencing these symptoms, especially if they have consumed I.M. Healthy SoyNut Butter products, they should see a doctor immediately. Early treatment can produce the best outcomes. If you or a loved one has been diagnosed with an E. coli O157:H7 infection or HUS after eating any I.M. Healthy SoyNut Butter product, call our experienced attorneys for help to protect your legal rights. If you have a question about this outbreak, leave a comment. We will keep you informed as more news breaks.